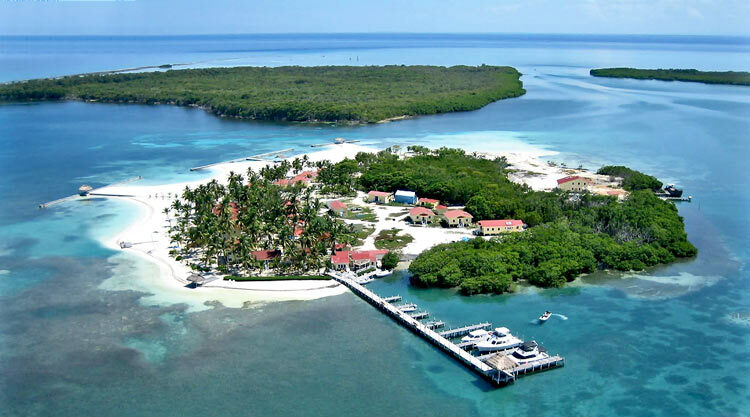 Belize is a former British colony and was named was named British Honduras from 1862 to 1973. It had already been inhabited for some time by British settlers from England and Scotland called “Baymen”. They settled from the early 17th century onwards and used the coastal bays to launch attacks of piracy on the Spanish. The Spanish, of course, owned the region as part of “New Spain”, but having pushed back the greatly depleted Mayan tribes of Gautemala and Mexico into these densely forested regions that had little to offer the Spanish mercenary armies, they decided to leave it “unsettled”. And so the Maya continued to live on in jungles bordering Gautemala and the Baymen continued to settle the coastal areas and plunder the Spanish ships. Soon though, the entrepreneurial skills of the Baymen saw them turn their hands to logwood trading – a trade that provided Europe with a highly sought fixing agent for woollen textiles – which eventually brought them in land and into conflict with the ever depleting Maya. The Baymen, growing ever stronger in number and wealth, got on with life in Belize for well over a century and nominated magistrates and set up their own independent colony. They also moved on from trading wood and began trading African slaves, hence the large population of African descent. The Spanish, the Maya and even the English tried to remove the Bayman, but all of them failed. After the Spanish were ousted from the region in 1821 the newly formed Guatemala assumed the territory of Belize to be theirs, but the Baymen carried on regardless. British authority was eventually agreed and then asserted, but it took the promise of building a road from Guatemala City to Punta Gorda to seal Belize as part of the British Empire in 1862. Slavery was abolished immediately, but with no money, no where to go, and nothing else to do, most of the slaves continued working for their masters as loggers on a pittance wage. For reasons not entirely of their own making, the British never did build the road, and from the 1940’s until very recently, Guatemala was again claiming Belize as theirs. 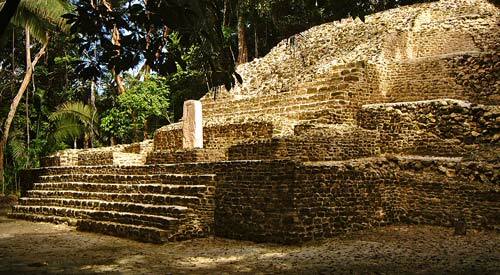 Lamanai: High TempleBelize’s ancient history comparatively straight forward. The Maya have occupied the region since approximately 1500BC, with the main cities being Lamunai and Caracol. 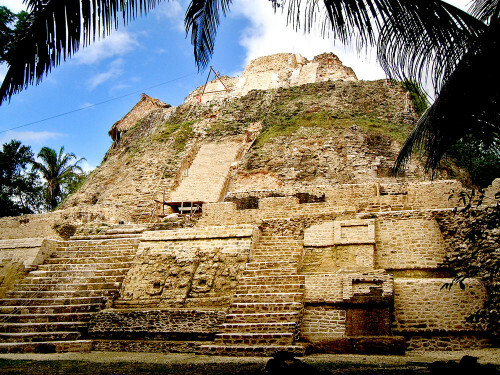 Ancient cities are found all over Belize, though none have had the depth of archaeological study or care of reconstruction that you find in nearby Mexico, Tikal or Copan. The cities have also been raided for stone by construction companies and the few sites that are being reconstructed appear to be done so by construction companies. On the positive side, they are also far less visited than those of Mexico, which means you can absorb their silent power in peace and reflect on this once mighty Civilisation and its achievements. 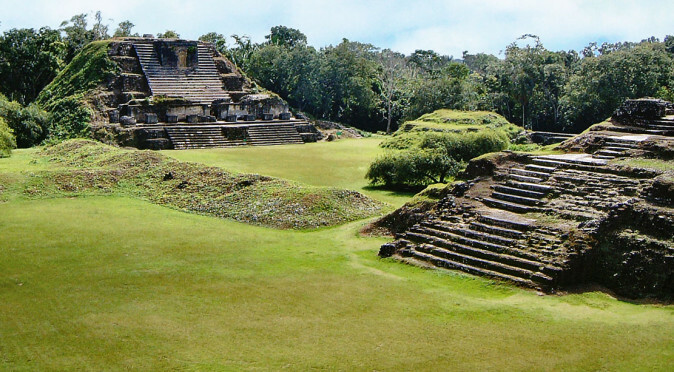 What is distinctly different about the sites in Belize is that some of them, such as Lamanai and Altun Ha, were inhabited right up until the 18th century, having been occupied for over 1000 years. 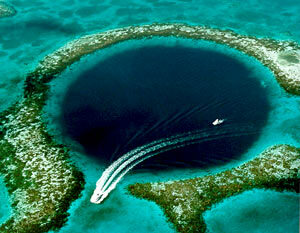 This is because Belize became something of a safe haven for the Maya, and Belize still has a high population of Maya. The Blue HoleAlthough Belize’s history is long and vibrant and worth visiting Belize alone, its historical pale in significance against Belize’s areas natural splendour. In the past few decades, it has become a top tourist destination for divers thanks to its crystal clear waters, that are home to the third largest coral reef on earth, and the remote paradise islands, that stand isolated amongst it all. The Belize reef is 190 miles long – longer than the mainland – and there are several “perfect” islands nestled amongst it that provide a five-star lifestyle within a remote paradise setting, and are ideally situated for scuba diving and snorkelling. So if you are looking for a destination that has beauty, activities, and history, whilst remaining a little off the beaten track – and most of the roads are nothing more than beaten tracks – then Belize will certainly entertain you for a few weeks. Getting in and out of Belize couldn’t be easier. Most people find it cheaper and more interesting to fly to Cancun and travel down by bus – and you can travel directly on an overnight bus if you really want – but the beautiful Mexican resort town of Playa Del Carmen and the quirky Mayan castillo of Tulum are both en-route and so most people build these into the journey and enjoy the scenic daytime travel. Just inside the Mexican border is Chetumal, which is an excellent base to travel the Mayan sites situated in the Reserva Biosfera Calakmul, and is only a few hours from Belize City. The Western Border is to Guatemala, with the closest town being San Ignacio, which is only a couple of hours from Belize City. San Igancio is then only a couple of hours from the Guatemalan town Santa Elena and mighty Mayan ruins at Tikal. To the south, you can only exit/enter by boat at Punta Gorda, with the easiest destination being Puerto Barrios in Guatemala, which takes around an hour – you can also visit Livingstone, which, unusually, is still only reachable by boat. From Puerto Barrios, the astounding Mayan ruins of Quirigua and Copan are each only a few hours travel. Therefore, Belize makes an excellent base for reaching the remote and glorious Mayan sites of Tikal, Quirigua and Copan, as well as providing plenty of its own mysterious sites.